The MAI®HICOMP-FOAM is a special purpose mortar mixing pump that sets new standards in process security. Its innovative water and dry material management makes the consistent production of high-quality lightweight porous concrete possible at the touch of a button. Produce adjustable foam concrete in quantities of 9 to 24 cubic meters per hour (with a mortar hose of min. nominal width 50mm and distance up to a maximum of 100m) for a silo flange diameter of 350 mm. 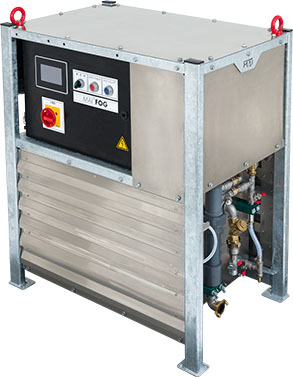 The MAI®FOG is a compact foam mortar generator in which, in addition to the amount of foam, the foaming agent percentage and the foam density can be easily adjusted. It is suitable both for mobile use and for mounting on the transport silo. 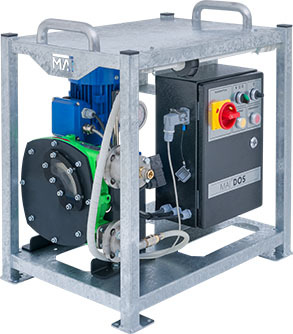 The MAI®FOAM-UNIT is a special purpose mortar mixing pump that sets new standards in process security. It is an innovative water and dry material management mobile mixing pump for lightweight porous concrete that does not allow even the slightest fluctuations in consistency. Several additives can be added without any change in consistency - even with pressure resistance in the mortar hose. 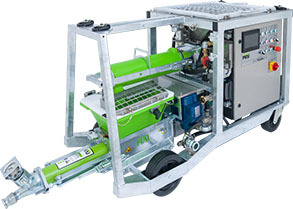 Produces adjustable foam concrete in quantities of 3 to 15 cubic meters per hour (with nominal mortar hose width min 50mm, distance up to a maximum of 80m). 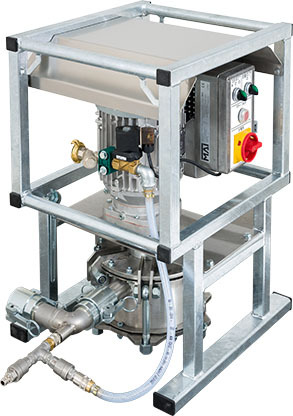 The MAI®DOS is a universally applicable dosing unit for liquid additives in a foam concrete production system. Dose additives at between 5 l/h and 160 l/h at up to maximum 12bar pressure. It is suitable for use with the MAI®HICOMP, MAI®MULTIMIX and MAI®440GE mixing pumps. The MAI®MIX is an electric agitator for foam mortar mixing with continuously adjustable speeds. It is suitable for use with the MAI®HICOMP and MAI®MULTIMIX mixing pumps. Our goal is to improve and facilitate the production of environmentally friendly PLC (porous lightweight concrete) materials for construction above and below ground. High-quality foam concrete requires little CO² and energy to produce, making it a very ecologically-friendly option. Foam concrete is an easily-workable, low-density building material that is very economical. Foamed concrete is self-compacting, free flowing and pumpable and, therefore, easy to place in inaccessible places. It has good thermal and acoustic properties and is also frost resistant. Cellular foam concrete can be produced in a variety of densities and strengths depending on the application required. Foam concrete has many significant benefits due to its high air content (up to 90%), making the material ideal for filling voids in underground engineering works, trench reinstatement and tunnel repair. It is also particularly useful for its insulating properties making it perfect for thethermal and soundproofing insulation of floors and flat roofs. Other areas where porous lightweight concrete is very useful are cavity filling, well backfilling, masonry grouting, setting up pipeline monolithic thermal insulation, monolithic low-rise and individual house building, levelling floors, road sub-bases and maintenance, bridge abutments and repairs, and ground stabilisation. 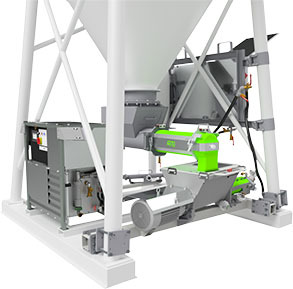 MAI has developed a range of porous lightweight foamed concrete production equipment that enables customised foam concrete for every application at the touch of a button. The user-friendly interface makes the production of lightweight foamed concrete simple, with the highest levels of quality control and easy combination of units to achieve the desired results for your project. The compact PLC equipment developed by MAI consists of an internally networked processing system that works continuously and can be operated as intuitively as a smartphone. The dry mortar compound is mixed and a foam of exactly defined consistency and density is produced. All individual components are under permanent monitoring to ensure process reliability. MAI foam concrete equipment is already in use in Japan and Europe. It is important to find the best lightweight foam concrete production system to maximise performance on your building project. Take a look at the extensive range of equipment for fully automated production of lightweight concrete available from MAI. Talk to MAI about the latest technology in lightweight foam concrete production systems. Our team of experts is happy to explain why cellular foam concrete should be part of your construction project plan.